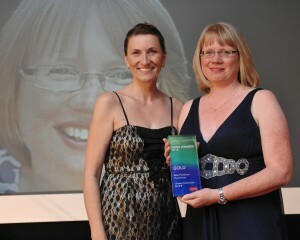 Lindsey was presented with her award by CIPR Chief Executive, Jane Wilson. News Release: Issued 5th October 2012. PR consultant, Lindsey Collumbell, from Ashtead, Surrey has won two business awards in recognition of her excellence in public relations. Run by the Chartered Institute of Public Relations (CIPR), these PRide awards recognise excellence in public relations by companies across all regions of the UK. Lindsey Collumbell has been named Best Freelance Practitioner, winning the gold award, and scooped silver in the Best Digital Campaign category for a website she developed, out of a pool of entries from across Surrey, Sussex and Kent (classed as the Home Counties South region). The Best Digital Campaign recognises excellence in the way that digital media is used to achieve business results. “Providing imaginative solutions to achieve business results is at the heart of what I do for all clients. To have my work independently recognised by judges with many years of industry experience is something I am very proud of and shows clients that my work is amongst the best in the region,” says Lindsey Collumbell. “The Home Counties South CIPR PRide Awards celebrate the best PR and communications campaigns and teams from across the region. The sheer number of high quality entries received this year, especially when things are still pretty tough out there economically, is testament to a thriving regional industry. The CIPR PRide Awards represent the best, most creative and most effective public relations work across the UK, and to be judged a Gold or Silver winner means your work has been judged as amongst the best in your area by leading PR experts,” Says Jane Wilson, CEO of the Chartered Institute of Public Relations (CIPR).